ST. GEORGE – While former Massachusetts Gov. Mitt Romney has repeatedly stated he has no intention of running for president again, a fellow Senate candidate isn’t so sure and wants that in writing. More specifically, he wants all of the Republican candidates for Senate to sign a contract with Utah voters that they will not use their Senate seat as a steppingstone toward challenging President Donald Trump in 2020. Meyers said his campaign has been contacted by “credible,” yet confidential sources in Washington, D.C., that claim Romney, who ran for president in 2012 against Barack Obama, may intend to challenge Trump in the 2020 Republican primaries. “Someone like Mitt Romney who has run for president before and has that type of natural connections with the establishment politicians who maybe oppose Donald Trump might have interests in doing that again,” he said. 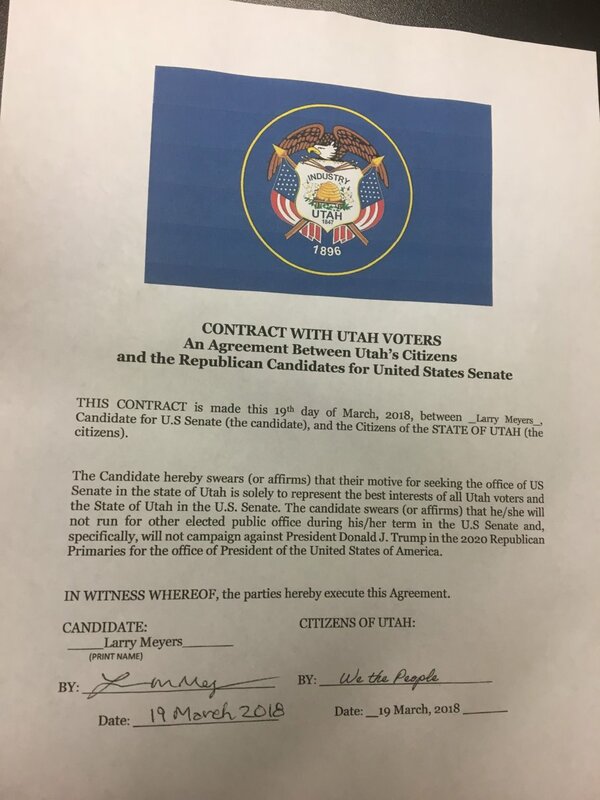 So now Meyers is challenging Romney and the other Republican candidates to sign the “Contact with Utah Voters” pledge he’s created. The pledge spells out that the Republican candidates, if elected, will serve the full term as Utah’s senator and will not use the position to challenge Trump for the presidency. “I challenge Mitt to sign that contract and come clean with the Utah voters,” Meyers said. Meyers has already signed the document and said he will be present copies to the other 11 Republican candidates to sign in the near future. Romney spokeswoman MJ Henshaw declined to comment. Since 2016, Romney, who ran for president twice, has been saying he has no intention of running for president again. While speaking with Bob Evans of Fox 13 News Sunday, Romney joked that he wanted to dispel rumors that he ran for president in order to pave the way to potentially becoming Utah’s next senator. Romney went on to reiterate he plans to serve as Utah’s senator and not running to president a third time. Sure Larry, got any more self promotional stunts? No doubt Romney’s gonna be all over your pledge. What is your point Larry? What a scam/sham….. Your property is a disgrace to the neighborhood and you don’t care. How can you work for the people when you are inconsiderate of your own neighbors? Wish I could post pictures of the … . Meyers just lost my vote. How unconscionable to produce a stunt like this to promote your campaign. I hope it backfires.